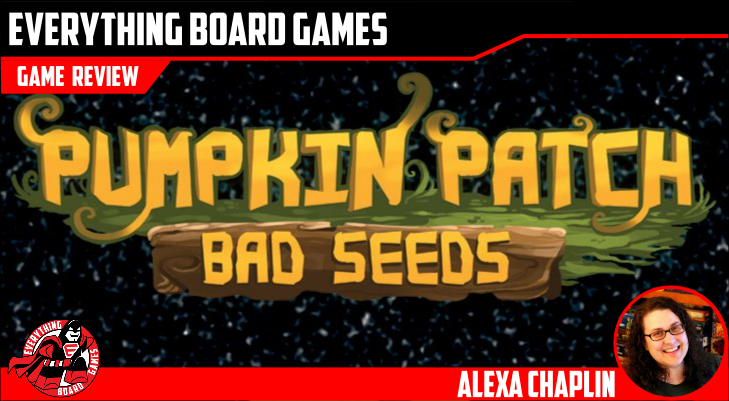 Pumpkin Patch: Bad Seeds is a game of pumpkin planting, crow scaring, and tile laying for 2-3 players. 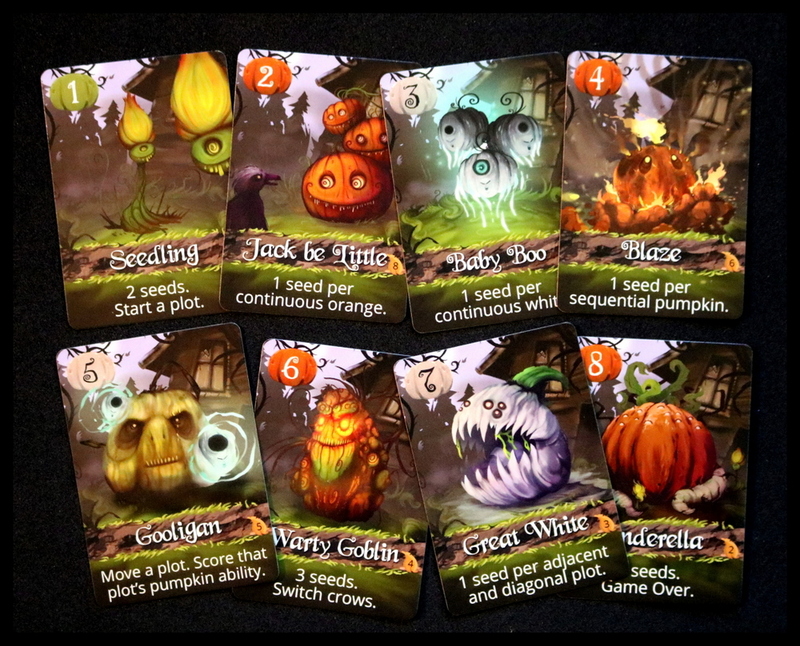 Each round, players must choose which type of pumpkin to plant in order to help grow the budding pumpkin patch. 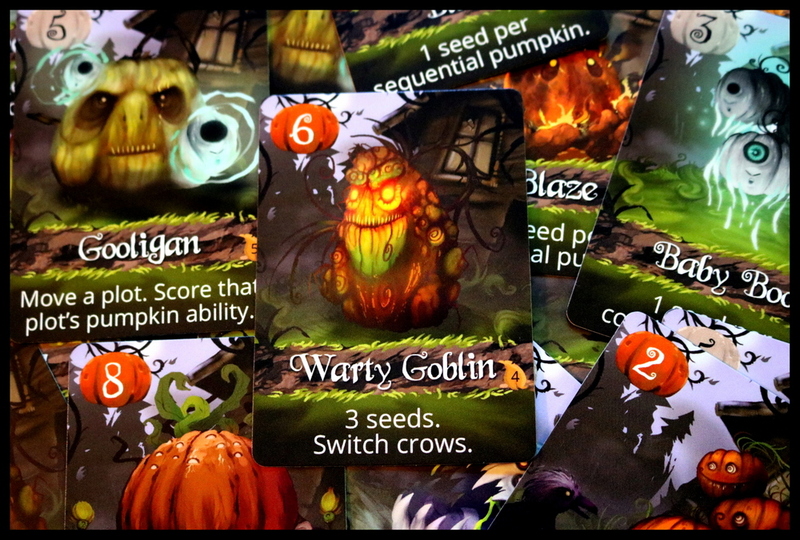 Each pumpkin planted grants the players victory seeds. The goal of the game is to collect as many seeds as possible before the final pumpkin is planted. Players will use Baby Boos, Blazes, and Warty Goblins to collect seeds and thwart their opponents efforts to do the same! 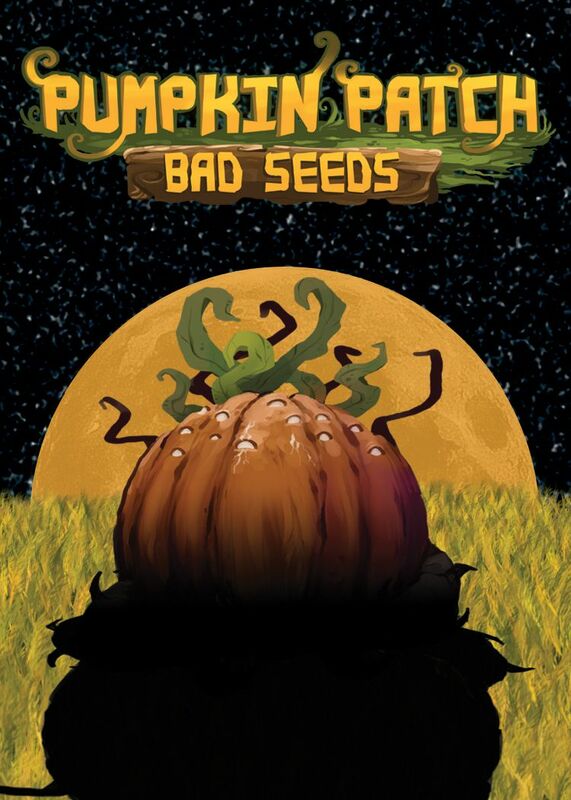 WARNING: This is a preview of Pumpkin Patch: Bad Seeds. All components and rules are prototype and subject to change. Pumpkin Patch: Bad Seeds will launch on Kickstarter on July 11, 2018. Are you ready for some spoooooooky games? Maybe putting yourself into the autumn frame of mind will help dispel some of this summer heat! 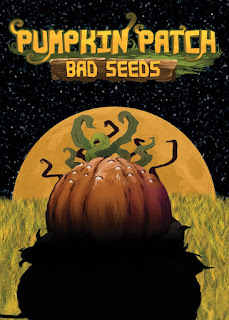 If you love everything Halloween and plan your fall around pumpkin carving and creepy costumes, take a look at Pumpkin Patch: Bad Seeds from Brouhaha Games. The theme winds its way through this quick card game like an ever-growing vine—here, you are trying to grow the best possible pumpkins in the patch in order to gather the most seeds before the final pumpkin is planted. Pumpkin Patch: Bad Seeds is a prototype card game, so the version that I played and am sharing with you today may not be final. The graphic design, card text, and rules texts will all get some tweaks for clarity and artistic vision, but the base game rules will not change. 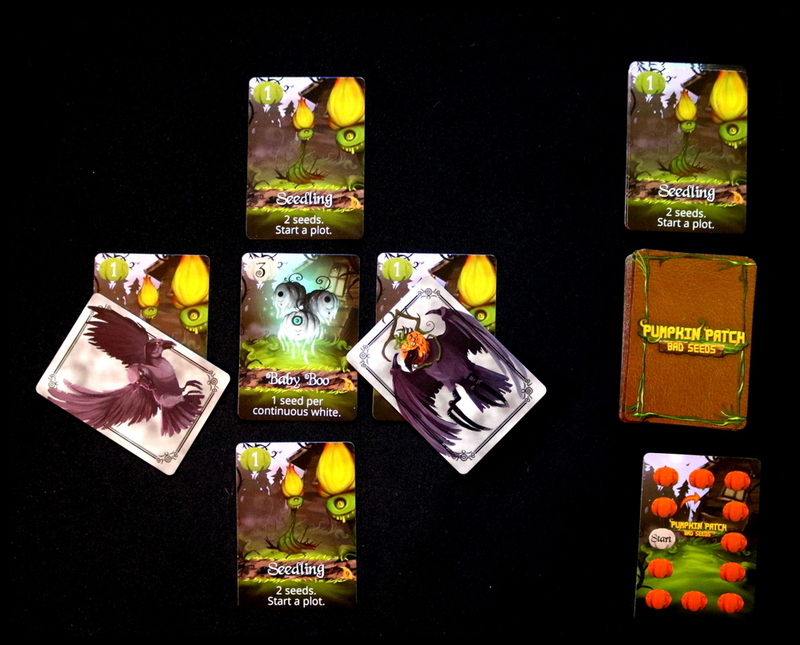 Pumpkin Patch: Bad Seeds consists of 44 Pumpkin Cards, 2 Crow Cards, and 1 Scoretrack Card, making it highly portable, and easy to take along with you to the pumpkin farm or the Monster Mash. My family enjoyed the artwork of the eight different kinds of pumpkins and the two crows and we felt it really embodied that Halloween theme. Set up is easy—put a few cards out in the lineup shown below, and you're ready to go. The starting player will be the one who has carved the most pumpkins in their lifetime! 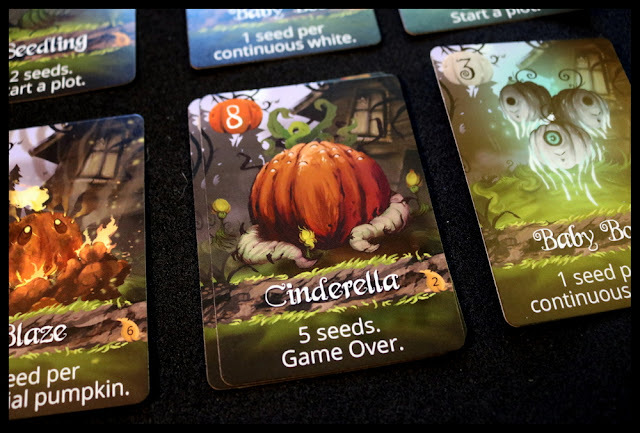 In Pumpkin Patch: Bad Seeds, you will take turns playing cards onto a communal pumpkin patch, growing each particular plot up in numerical order up from the #1 Seedling to the #8 Cinderella Pumpkin. Each time you play a card, you will gain a certain number of seeds (tracked on the Scoretracker card) and sometimes you will also be able to take a certain action, like moving an already started plot. After you have played your card, you get to move your crow. 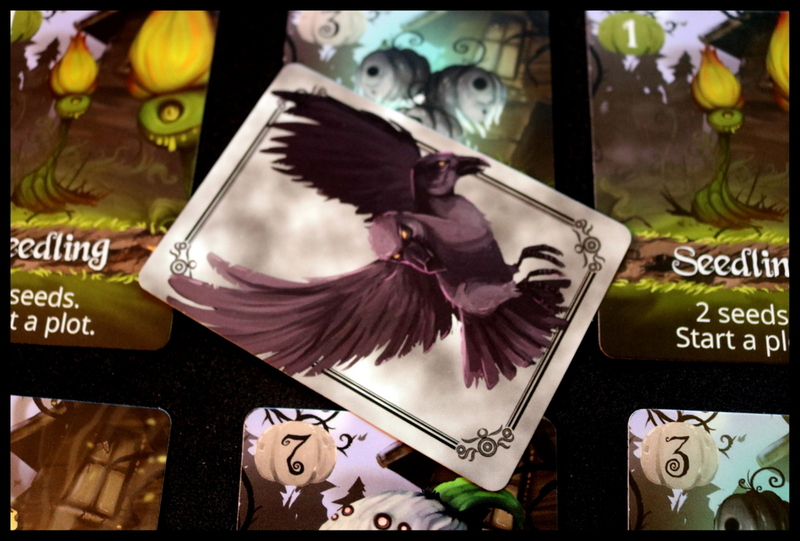 In a 2-player game, each person chooses a crow and will only move that one; in a 3-player game, each player may move either crow on their turn. A crow covering a plot blocks it from being grown or moved, so there's strategy here in trying to block your opponent's moves or to save a plot for your own needs. Some cards will let you score for the number of adjacent orange (or white) pumpkins—the color shown in the upper left along with the pumpkin's number. Others let you score for the number of adjacent pumpkins in numerical order, or the number of surrounding pumpkins. 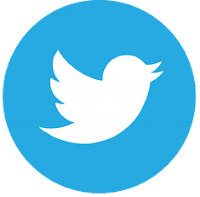 There is strategy in your placement, as you try to set up good moves for yourself, only to be thwarted by your opponent's crow, or to have the plot you were eyeing moved to the other side of the garden. Once a player is able to play the #8 Cinderella Pumpkin, that player scores 5 seeds for the placement and the game ends—whoever has more seeds is the Pumpkin King and Champion Pumpkin Grower! The artwork is appropriately eerie, without being truly scary or gory. 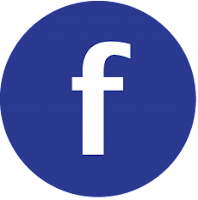 The gameplay of Pumpkin Patch: Bad Seeds is simple enough for kids and families, and easy to teach, but lends itself to a little bit of strategy as you try to plan out the best garden rows to suit your needs. My family enjoys having a shelf of Halloween games that we pull down each October, and we're looking forward to adding this family-friendly filler to that pile! One thing we might change about Pumpkin Patch: Bad Seeds is the Scoretracker—at only 11 points, it is too short for a single game, and we sometimes lost track of how many times each of us had gone around (did I lap you yet, or not?). 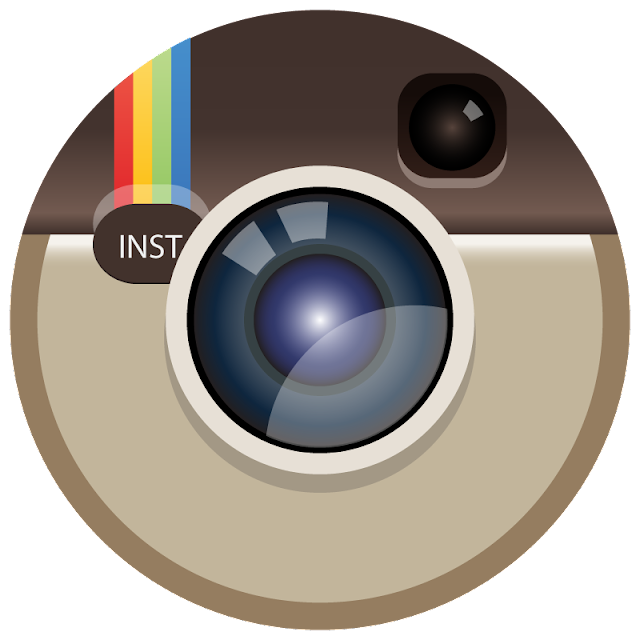 It seems like an easy enough thing to change, and wasn't a big detriment to our enjoyment. Some people who played the game with me didn't like the crows—they didn't want the take-that mechanism in what could otherwise be a very puzzley kind of game. 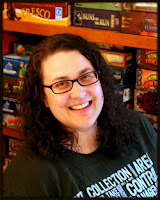 Personally, I love to think on my feet, roll with the punches, and get a little chaos wrapped into each game, so I enjoyed sending my crows to just the plots I thought might interfere with my opponent's plans! Gamers who enjoy filler games with just enough thinking and strategy like Wonderland, What's Up, or Tally Ho will probably enjoy Pumpkin Patch: Bad Seeds. Obviously, it will be a hit with fans of Halloween-themed games, too! 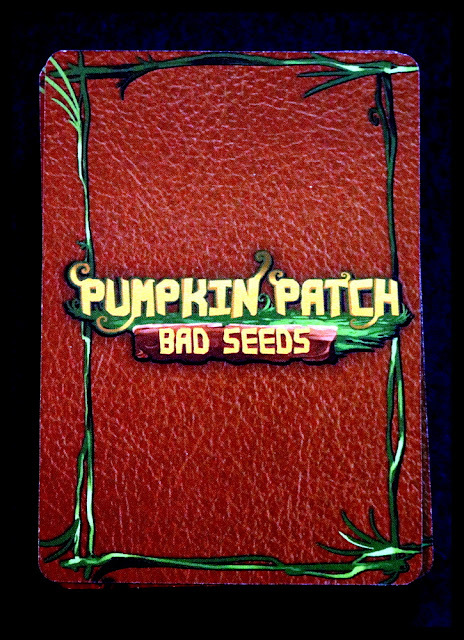 Pumpkin Patch: Bad Seeds hits all the right pumpkin-spice notes, making it a perfect autumn filler or on-the-go game. We will enjoy adding this one to our Halloween game shelf!